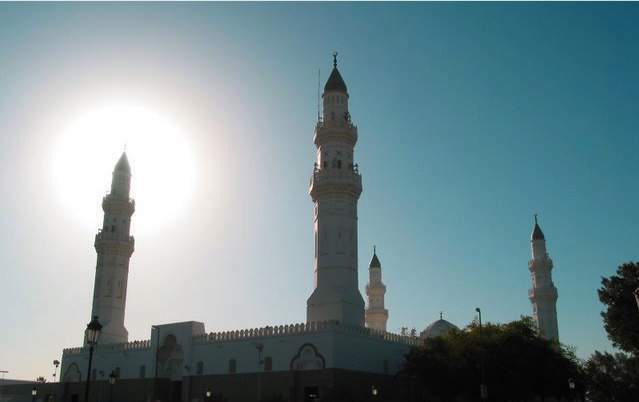 On Monday, September 23, 622, prophet Mohammed, sallalahu ‘alaihi wassalam, arrived at a town in Madinah named Quba. He stayed with Khulthum bin Al-hadm, a hospitable chief of the tribe of ‘Amr bin ‘Awf. 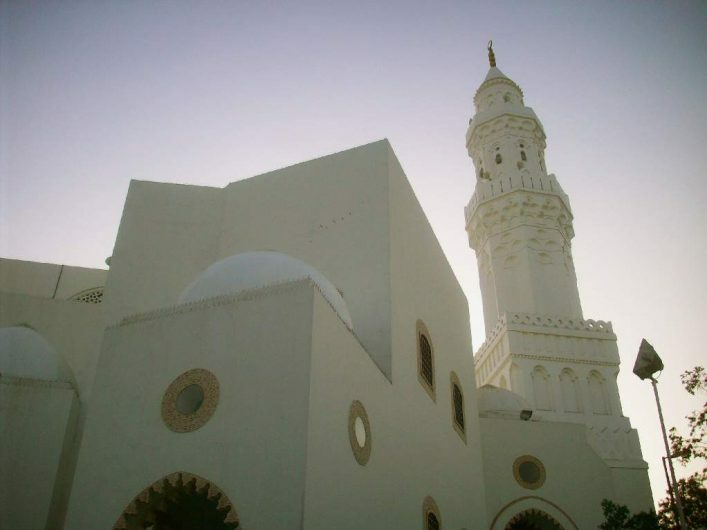 Here he spent four days, and it was during this period that the foundation of the Quba masjid was laid, based on pure piety. 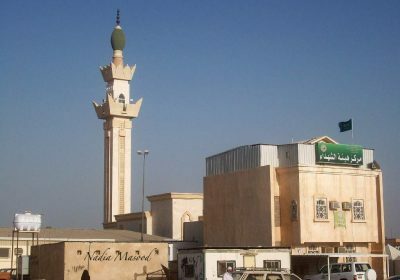 Prophet Mohammed, sallalahu ‘alaihi wassalam, positioned its first stones and was completed by his companions, making Masjid al Quba the first mosque in the history of Islam whose foundation stone was laid by the prophet Mohammed, sallalahu ‘alaihi wassalam, himself and is also the first mosque in which he prayed with his companions openly in congregation. 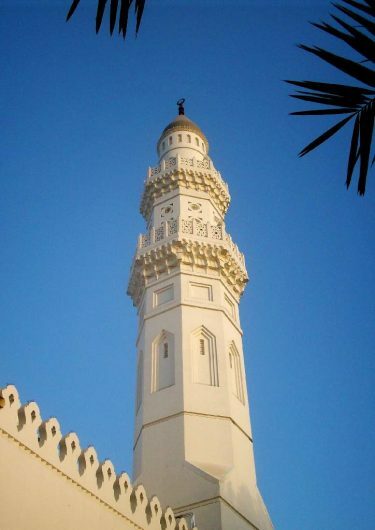 Masjid al Qiblatain, or the ‘Mosque with Two Qiblas’, is one of the oldest mosques in the world and is unique because it contains two mihrabs – one in the direction of Bayt al Muqaddas (Jerusalem) and the other facing Ka’aba. 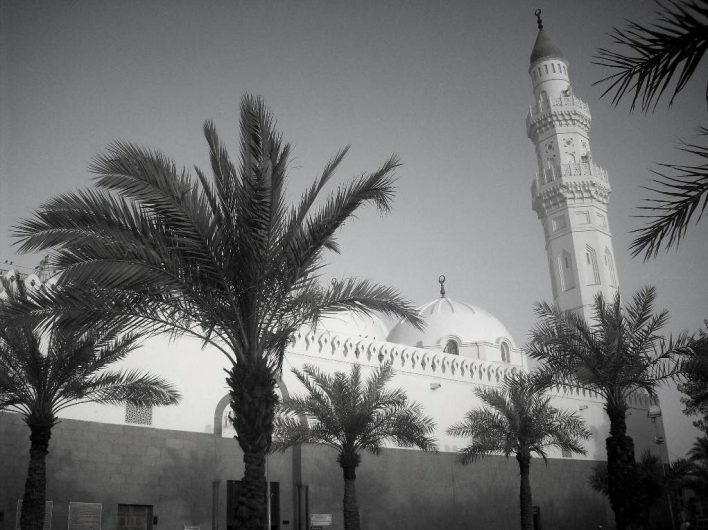 In Madinah, the Jews offered their prayers facing Bayt al Muqaddas. 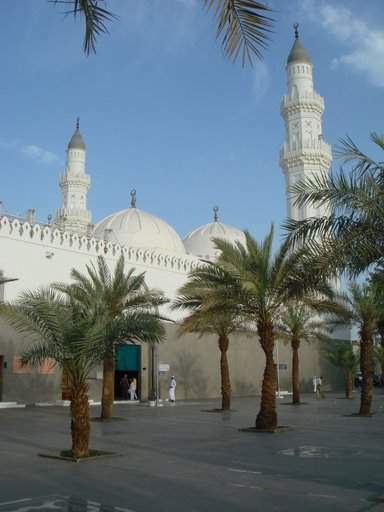 The Prophet, sallalahu ‘alaihi wassalam, and his companions also offered prayers facing the same direction. This had been their practice from Makkah and had continued until the second year after hijrah. 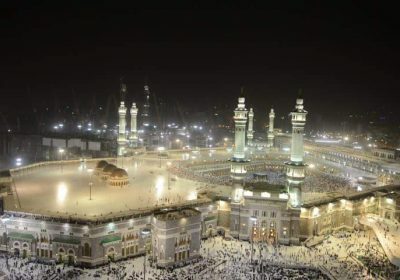 But the Jews argued that though the Muslims claimed to have a religion whose laws superseded all other previous laws, they don’t have their own qiblah to face. The Prophet Mohammed, sallalahu ‘alaihi wassalam, had already finished the second raka’at of the noon (dhu’r or as’r) prayer facing Jerusalem, when Jibraeel alayhis salaam, communicated the command of Allah to him to turn around completely. So Prophet Mohammed, sallalahu ‘alaihi wassalam, turned his body and faced Ka’aba during prayer, and so did his followers. This happened two months before the battle of Badr. 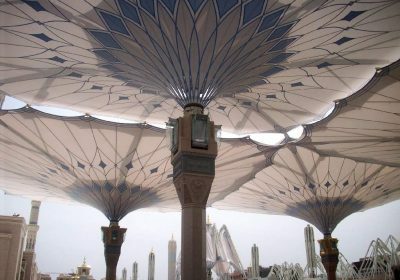 The change in the direction of the qiblah also served as a test of faith for the people. 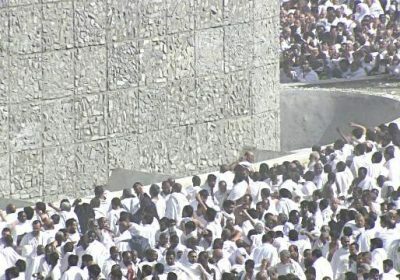 They were tested by seeing if any of them refused or delayed turning towards the new qiblah as ordered by Allah. MashaAllah, lovely pictures. Esp. the last last one with the glow of the sun in the background. I love the verses and their tremendous meanings and intention of our Lord, Almighty Allah. 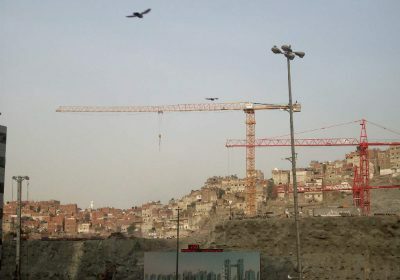 Every post of this journey reminds me how near we were to the history of Islam. 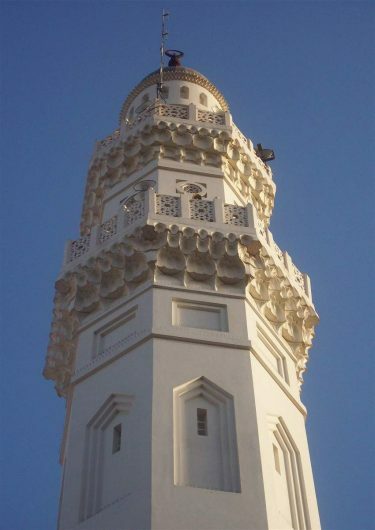 Such intricate detail on the minarets! Looks amazing. Nice of you to share your journey with us, and thanks for praying for us. 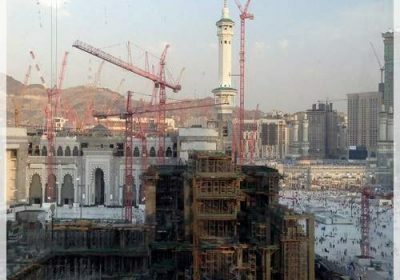 One question… if there’s two mihrabs, is there some indication as to which one is Makkah and which one is Jerusalem? Otherwise I was thinking people might get confused! I feel the Quba and Qiblatain has some special environment. I mean, just the air there makes you fall in love with it. I felt my association with it strangely warm and as if, I belong there . I remember I wanted to visit it again when I was there, but sadly it wasn’t in my fate so I returned with this wish in heart that still makes me miss it. “Quba! Quba! Quba!” This is what the Taxi drivers shout outside Masjid-e-Nabvi and make your heart melt again. Yes, for those who know the history behind these masajid, there’s this special feeling when you visit – something you can’t truly describe with words.